Canaca Review 2019: Is Canaca a Good Hosting? Canadian web hosting provider Canaca has been in business since April 1998. With over 20 years in the hosting industry, there is no doubt that they have stood the test of time in a challenging sector. Canaca’s hosting solutions include shared web hosting, VPS, and dedicated servers. Web hosting provider Canaca was established in Toronto, Canada in April 1998. With over 20 years of hosting experience, their commitment to providing reliable hosting services is reflected by the 3,600+ domains hosted on their servers. This relatively small provider’s shared web hosting, VPS, and dedicated server solutions are best suited to small and medium-sized businesses. Canaca owns and maintains its own servers and other hosting infrastructure. The company does not lease any of its hosting facilities to others, thus assuring its customers of high-quality services and unmatched availability. Well, that’s the theory, but while this vendor makes big claims about high availability and excellent website loading speeds, the reality is that sometimes some of its hosted websites load very slowly due to overloaded servers and low bandwidth. And these problems can sometimes last up to 24 hours. Backups are performed every 3 to 5 days for websites of less than 1GB. Therefore, businesses needing daily backups of databases bigger than 1GB might not be best served by this vendor’s solutions. Canaca also insists that users must maintain their own website backups because the Canaca backups are really only for disaster recovery rather than rollback purposes. In terms of operating systems, Canaca’s clients can use the Centos 7, Ubuntu 16.04 LTS, and Fedora 27 Linux distributions for free with their hosting solutions. Canaca’s hosting solutions are quite expensive. And unlike most other vendors who offer cPanel for free, this vendor charges their customers an exorbitant cPanel license fee on top of its hosting charges. Factoring in the fact that their servers sometimes experience prolonged periods of downtime (despite claiming to offer a 99.9% uptime guarantee), the high prices are probably not justified. On the plus side, Canaca’s plans do come with a 30-day money-back guarantee so you can sign up relatively risk-free. You can contact Canaca’s 24/7 technical support team via email, telephone, or ticket, but not live chat. Although their support is advertised as 24/7, all of their listed phone numbers appear to go straight to voicemail, and my submitted ticket was closed before my concerns had been adequately addressed, and the team took two weeks to respond to an email I had sent them. This could be very frustrating for customers experiencing a hosting emergency, especially since there is no knowledge base to turn to for self-support. I would be tempted to turn to the Canaca community (including an FAQ section) for additional help and advice, were it not for the fact that my IP address has apparently been banned from accessing it. Wow! What did I do? While Canaca.com is a veteran of the hosting industry, the apparent issues with server overloading and downtimes concern me greatly. So if you can’t afford to run the risk of unplanned downtimes, you should probably steer clear of this company. That said, Canaca can adequately deliver good hosting to small companies and startups that have relatively low resource demands. 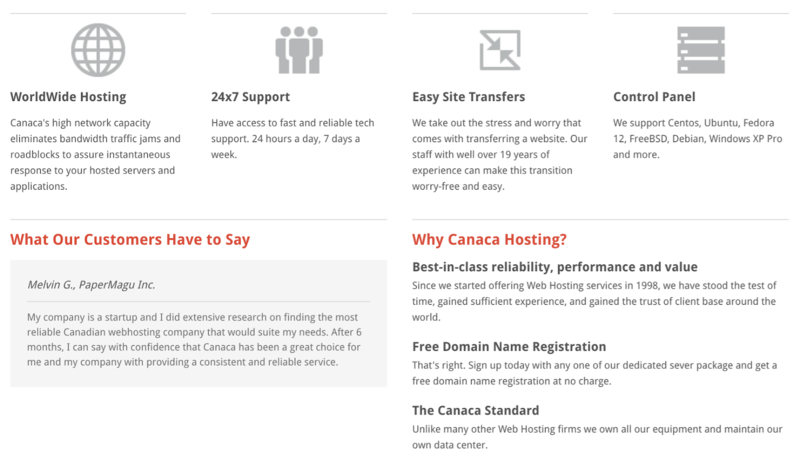 Wondering how Canaca stacks up against other Web Hosting companies? Enter any other Web Hosting company and we will give you a side-by-side comparison.